Over the next few years is expected that Bergen’s population will increase in 440 000 inhabitants. An important question will be how this growth will affect Bergen and the various neighbourhoods distinctive identity. New developments will lead to increase homogenization so that districts in the future will emerge as equal? Or let’s imagine another scenario, can “genius loci” or neighborhood’s character form the basis for development, so Bergen can emerge as a complex and diverse city?. For us, this question relates to numerous conditions including how we plan for new housing development, industry and recreation. How do we want the future living and working environment to be? How will future neighborhoods in Bergen metropolis compete for jobs, investment and people? Arna has important questions related to how water, nature and ecology form the basis for a unique urban environment. Can we learn from Arna’s past and let this be the basis for the creation of new residential and commercial environments? new housing and business communities? A particular feature of Arna is that despite its proximity to the city center has not grown significantly over the last 30 years. The reasons for this are many. 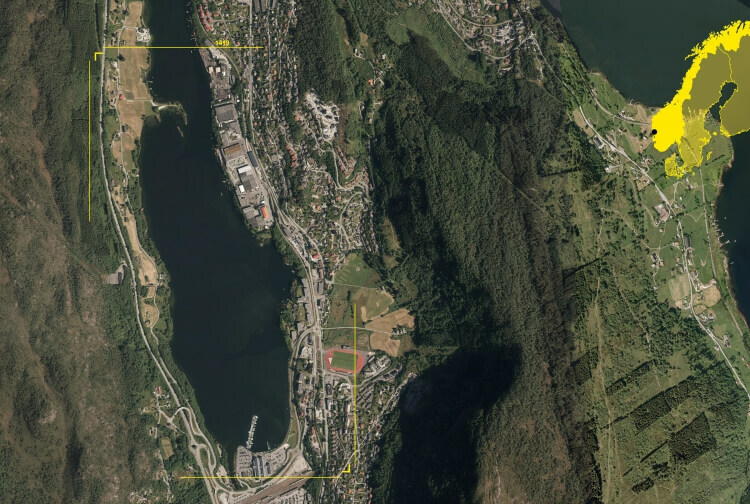 Arna’s proximity to the city center of Bergen by train (7 minutes) has rarely generated development, and it takes about 35 minutes to drive between Arna and Bergen, an experience of a remote district. Moreover, the area suffered from a serious lack of investment in infrastructure and public facilities. Finally Arna’s topography with little sunlight, especially in winter, also meant that the area has been rated as an unattractive spot for development. Arna’s lack of attractiveness has meant that, while other districts as Åsane, Fana and Sandsli has grown, Arna has slept. And for us, this is an interesting point. Double trail with 2 km radius has been planed. Arna is in need of a clear vision that takes into consideration and stars the unique fjord landscape. The project has developed its concept by moving the center to Storaneste, strengthen business long river course and establish floating homes on the bay.